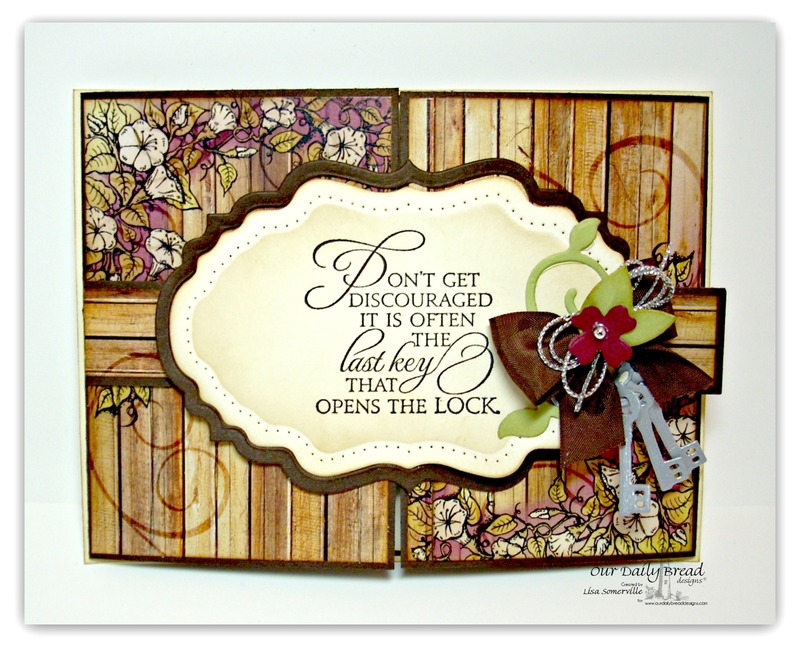 Welcome to the New Release post showcasing projects from Our Daily Bread Designs May Release! You can see all of the May Releases here. Continue reading below to find out how you can win one of three $15 Gift Certificates to the ODBD Store good towards the purchase of ODBD stamps. Today, I am sharing two fancy folds projects with you that use some of the stamps, ODBD Custom Dies and new paper collection from the May Release along with a few previously released ODBD Custom Dies. My first card is a Gate Fold Card, I used the ODBD Custom Vintage Flourish Pattern and ODBD Custom Vintage Labels Dies to create the closure on the card. 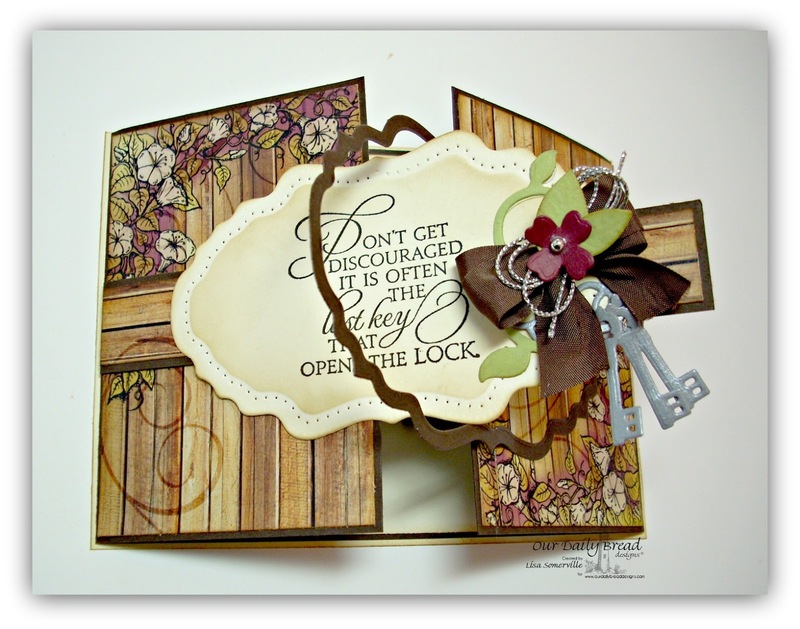 I stamped the sentiment from Key to Heaven in Espresso ink and clear embossed, then die cut the Vanilla panel using the ODBD Vintage Flourish Pattern Die. I used Ranger Gathered Twigs Distress Ink to add color to the inside and edge of the die. 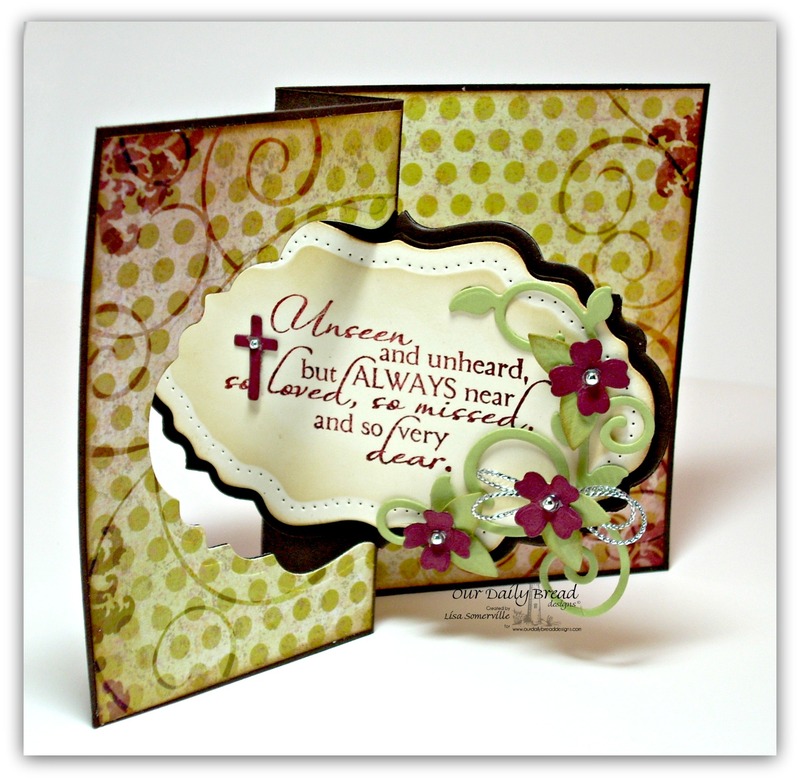 This panel is layered on an Espresso panel die cut using the ODBD Custom Vintage Labels Die. All pattern paper is from the ODBD Rustic Beauty Paper Collection. To embellish I added die cuts using the ODBD Custom Angel Wings Die (keys), ODBD Custom Ornamental Crosses Die (flower), ODBD Custom Fancy Foliage Die (leaves/flourish), and Silver cording. My next card uses the Partial Die Cutting Technique to created a Flip Fold card. The Espresso card stock panel is 7-1/2" x 4-1/4", scored at 2-3/4" and 3-3/4", then folded in a zig-zag pattern. 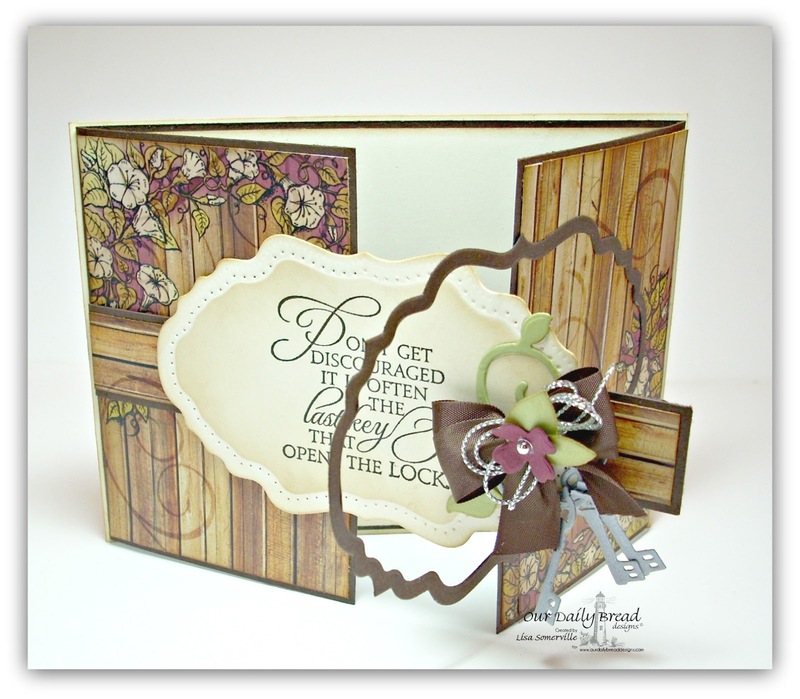 I attached a piece of the ODBD Rustic Beauty Paper Collection to both sides. To die cut the panel, I adhered the ODBD Custom Vintage Labels Die to smaller panel, aligning the center of the die with the 2-3/4" score mark, holding the die in place with EZRelease Tape so it won't shift when die cut. I placed the top Acrylic Plate to the 2-3/4" mark and die cut. Leaving the die in place, rotate your card stock and place the Acrylic Plate to the 3-3/4" score mark and die cut. Using the same die, die cut two pieces of card stock that will cover the die portion your just cut from your base card. Die cut a second die and stamp as desired. 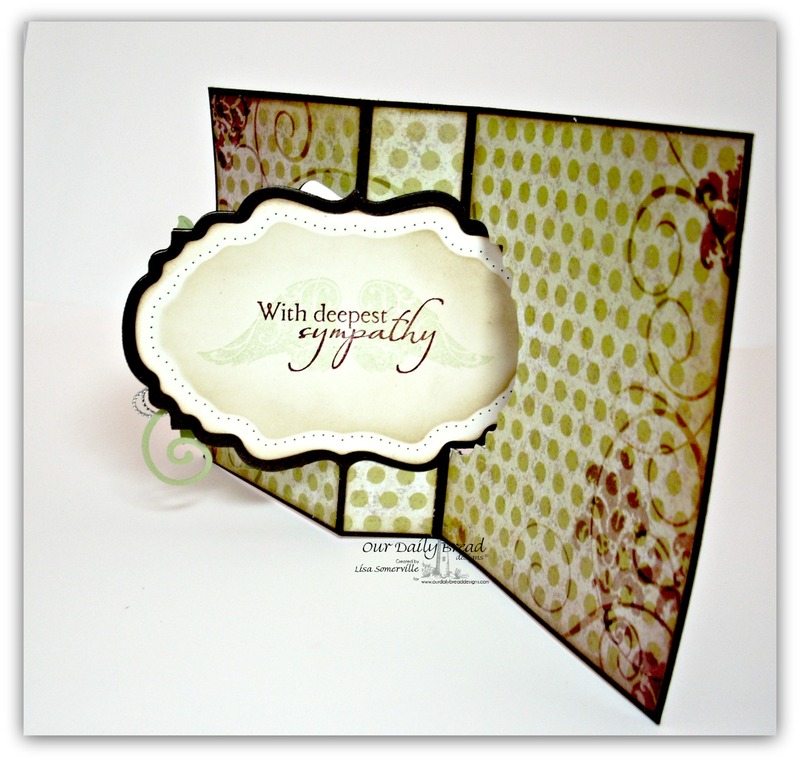 I die cut the Vintage Flourish Pattern Die from Vanilla card stock for my layered panel. On the front panel, I embossed the sentiment from Carried to Heaven. On the inside I stamped the angel wings from Holy Angels stamp set in Celery ink, then embossed the sentiment from Carried to Heaven. I added ink to both panels using Rangers Gathered Twigs Distress Ink. To embellish I added die cuts using the ODBD Custom Ornamental Crosses Die (flower), ODBD Custom Fancy Foliage Die (leaves/flourish), and Silver cording. Kelley will randomly be selecting 3 winners who will each receive a $15 gift certificate to Our Daily Bread Designs, good towards the purchase of ODBD stamps, just for commenting on the Design Team cards! You have until Friday, May 2, 2014 at 9:00 p.m. EDT to leave your comments. The Winners will be posted May 3rd, on the Our Daily Bread Designs Blog, so be sure to check back there to see if you are won! Wowza, girl!!! I LOVE your ramped up version of the gatefold.....so cool and so gorgeous!!! Love the flip fold too....you are the queen of techniques!!!! Love them both so much!! HUGS!! can always count on you to inspire me to do something other than the same.old.fold! how perfect the new vintage labels for the closure! love it! and I've got to give the partial cut a try... fabulous samples! These are both beautiful! Great job on all the extra details! Wowza Lisa, you really rocked this release! Your cards are AMAZING, i love the folds so very inspiring. Goodness Lisa, these are fabulous. wonderful designs to show case this fabulous new release. How unique and gorgeous!!! Wow....what a lovely technique and beautiful card!! Oh My Goodness Lisa!!! I LOVE both designs! So incredible! So inspiring! What gorgeous folds and cards Lisa!! Your designs with the interlocking dies and your designer paper is stunning. Beautiful work Lisa!! Oh my goodness, these are both so awesome. Love the fancy folds and dp! I really like how you faintly stamped the wings behind the greeting on the second one. Both are wonderful, Lisa! The different folds are just terrific and work so well w/ the papers and die cuts. Great job! Your fancy folds are wonderful--never saw the first one. Gorgeous work! Fancy yes indeed! Oh Lisa these are all so beautiful and so detailed! Love what you have done! You always have the different folds Lisa... I love how they spotlight the dp so beautifully... especiall the interlocking label gatefold! Both are just beautiful!!! Wow Lisa - these are impressive!! I love the special fold cards - you make them seem so easy and yet so stunning. Love the papers you chose, and all your wonderful embellishments, ribbon, cording, gems make them even more special. wow!!! love both cards and your fancy folds!!! sooo pretty!! Your unique folds always inspire me! What unique and gorgeous creations! Love them both! Beautiful folds, rich colors and delightful stamps make for the best projects! Thanks for inspiring me! so so beautiful. each of the folds are just awesome and clever idea with the first one. papers are wonderful. just beautiful samples girlie. WOW, Lisa! When can I come create with you! LOVE your folds, use of designer papers, and accents! Your gate fold card is amazing…I keep looking at it, trying to figure it out…I think I've got it! Hugs, my friend! Love both these cool fold cards!!! Thanks so much for them!! Beautiful as always!